Carl Icahn is now looking for eBay to spin off just 20% of PayPal. Carl Icahn has staged a retreat in what looks like his latest failed battle with the tech industry. The activist investor has abandoned his push for eBay (EBAY) to spin PayPal off into its own company. Instead, he proposed Wednesday that eBay conduct an IPO for PayPal in which only 20% of shares would be sold to the public. "PayPal is a tremendous company, but it is on the verge of going to war against strong adversaries," Icahn said in an open letter. "Only with the benefits of being an independent company ... will PayPal be capable of winning that war." EBay said it was "glad to see that Mr. Icahn now seems to agree that a full separation of PayPal is not a good idea," and that a partial separation "is not a new idea." "As the lines between online and offline commerce continue to blur, the competitive advantages of PayPal and eBay together are more important than ever," eBay said. Icahn believes PayPal is undervalued as a unit of eBay, and that it would benefit from a focused, independent management team. The fight has grown increasingly bitter since he revealed a 0.82% stake in eBay earlier this year and began his push for a spin-off. Icahn has argued that eBay is mismanaged, and that board members Marc Andreessen and Scott Cook face conflicts of interest. 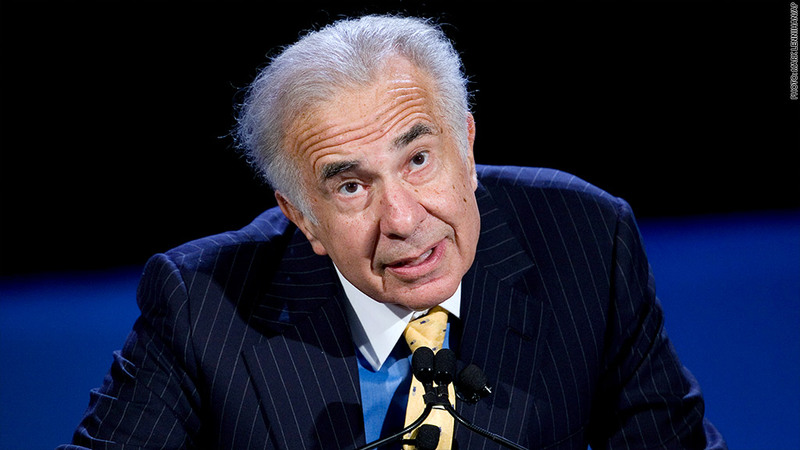 EBay has called Icahn's claims "unsubstantiated." In a blog post this week, Andreessen posted an article accusing Icahn of stripping the assets of defunct airline TWA and running the company into the ground. Icahn is well-known for his strong-armed tactics with public companies, but he hasn't fared so well in his pushes for strategic change at tech companies. He backed off last month from his push for a stock buy-back at Apple (AAPL). In October, he sold off half of his massive stake in Netflix (NFLX), after arguing unsuccessfully that the company should be taken over by a larger firm. Icahn also lost his battle last year to take over Dell (DELL) and replace its leadership, with shareholders voting for a Michael Dell-led buyout instead. In 2008, he failed in his bid to have Yahoo (YHOO) sell itself to Microsoft (MSFT), and resigned from the search firm's board the following year. He did score a victory with Google's $12.5 billion purchase of Motorola Mobility, after years in which he had pushed for shake-ups at Motorola. Yet even when Icahn loses strategically, he can still win financially. Netflix shares rose a stunning 450% during his agitation with the company. Apple shares rose 14% during his buy-back push, while eBay shares are up around 4% this year.